The fourth quarter was a rough one for most investors, as fears of a rising interest rate environment in the U.S, a trade war with China, and a more or less stagnant Europe, weighed heavily on the minds of investors. Both the S&P 500 and Russell 2000 sank as a result, with the Russell 2000, which is composed of smaller companies, being hit especially hard. This was primarily due to hedge funds, which are big supporters of small-cap stocks, pulling some of their capital out of the volatile markets during this time. Let’s look at how this market volatility affected the sentiment of hedge funds towards IAC/InterActiveCorp (NASDAQ:IAC), and what that likely means for the prospects of the company and its stock. Hedge fund interest in IAC/InterActiveCorp (NASDAQ:IAC) shares was flat at the end of last quarter. This is usually a negative indicator. The level and the change in hedge fund popularity aren’t the only variables you need to analyze to decipher hedge funds’ perspectives. A stock may witness a boost in popularity but it may still be less popular than similarly priced stocks. That’s why at the end of this article we will examine companies such as Total System Services, Inc. (NYSE:TSS), Hartford Financial Services Group Inc (NYSE:HIG), and Cheniere Energy, Inc. (NYSEAMEX:LNG) to gather more data points. In today’s marketplace there are a lot of signals market participants use to evaluate their holdings. A pair of the most under-the-radar signals are hedge fund and insider trading signals. Our experts have shown that, historically, those who follow the best picks of the elite fund managers can trounce the broader indices by a healthy amount (see the details here). 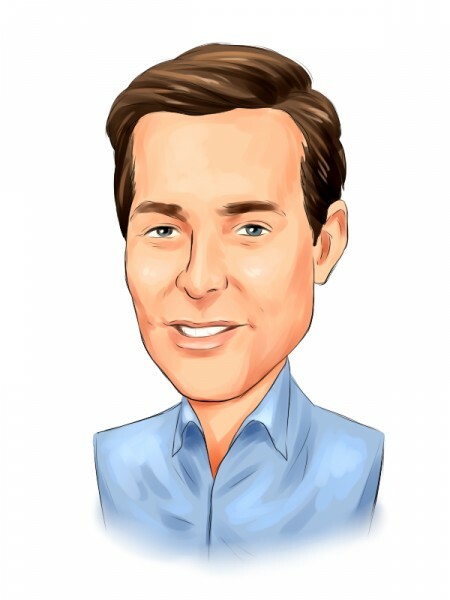 We’re going to take a gander at the fresh hedge fund action regarding IAC/InterActiveCorp (NASDAQ:IAC). What does the smart money think about IAC/InterActiveCorp (NASDAQ:IAC)? At Q3’s end, a total of 51 of the hedge funds tracked by Insider Monkey were long this stock, no change from one quarter earlier. 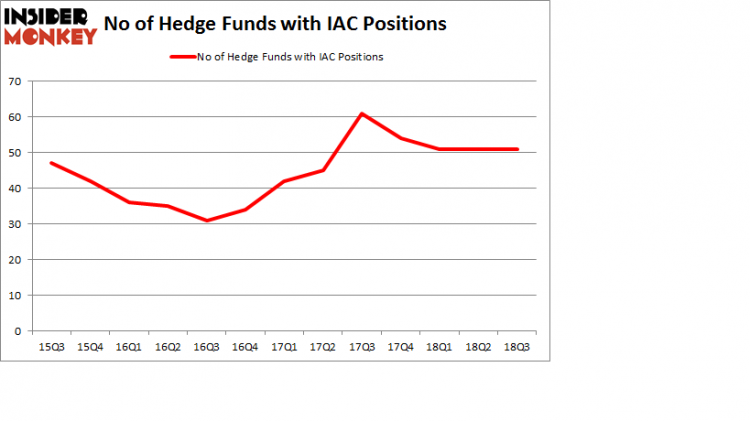 The graph below displays the number of hedge funds with bullish position in IAC over the last 13 quarters. So, let’s examine which hedge funds were among the top holders of the stock and which hedge funds were making big moves. More specifically, Luxor Capital Group was the largest shareholder of IAC/InterActiveCorp (NASDAQ:IAC), with a stake worth $330.2 million reported as of the end of September. Trailing Luxor Capital Group was AQR Capital Management, which amassed a stake valued at $317.4 million. Aristeia Capital, Marcato Capital Management, and Cadian Capital were also very fond of the stock, giving the stock large weights in their portfolios. Because IAC/InterActiveCorp (NASDAQ:IAC) has faced bearish sentiment from hedge fund managers, logic holds that there lies a certain “tier” of money managers who sold off their positions entirely heading into Q3. It’s worth mentioning that Gabriel Plotkin’s Melvin Capital Management dumped the largest position of the 700 funds watched by Insider Monkey, valued at close to $45.8 million in stock. George Soros’s fund, Soros Fund Management, also sold off its stock, about $25.6 million worth. These moves are interesting, as aggregate hedge fund interest stayed the same (this is a bearish signal in our experience). Let’s now review hedge fund activity in other stocks – not necessarily in the same industry as IAC/InterActiveCorp (NASDAQ:IAC) but similarly valued. We will take a look at Total System Services, Inc. (NYSE:TSS), The Hartford Financial Services Group, Inc. (NYSE:HIG), Cheniere Energy, Inc. (NYSEAMEX:LNG), and Magna International Inc. (NYSE:MGA). This group of stocks’ market caps match IAC’s market cap. As you can see these stocks had an average of 33.5 hedge funds with bullish positions and the average amount invested in these stocks was $2.32 billion. That figure was $3.13 billion in IAC’s case. Cheniere Energy, Inc. (NYSEAMEX:LNG) is the most popular stock in this table. On the other hand Magna International Inc. (NYSE:MGA) is the least popular one with only 20 bullish hedge fund positions. Compared to these stocks IAC/InterActiveCorp (NASDAQ:IAC) is more popular among hedge funds. Considering that hedge funds are fond of this stock in relation to its market cap peers, it may be a good idea to analyze it in detail and potentially include it in your portfolio. Billionaire Leon Cooperman’s New Stock Picks HMI Capital’s Returns, AUM and Holdings Here is What Hedge Funds Think About Movado Group, Inc (MOV) Simcoe Capital Management’s Returns, AUM and Holdings Is MGM Resorts International (MGM) A Good Stock To Buy? Is Mohawk Industries, Inc. (MHK) Going to Burn These Hedge Funds?